The "caucus" submitted several policy proposals to the membership, and most of them sought to soften policies that were perceived as "harsh". The first caucus proposal to come up for a vote sought to delete the plank calling for a striking of section 3. Presumably (there was little explanation here) what concerned caucus here is that prohibitions against discrimination would be weakened should the section simply be struck (there is language to the effect of "indicates discrimination or an intention to discriminate" in the section). The question for me, however, was why there was any need to finesse this policy plank when even the Sheldon Chumir Foundation, which draws its name from a former Liberal MLA, thinks a simple repeal of section 3 acceptable. A Wildrose Government will review labour laws to ensure fairness for all workers whether employed in union or non-union settings. To one lot of people, fairness means establishing the same rules for everybody, playing by them, and letting the best man win and the winner take all. To another, it means making sure that everybody gets equal shares. The Economist "will have none of it". But the Wildrose caucus evidently can't get enough of it, because they wanted yet another clause in the Labour section deleted and replaced with "fairly" (albeit this time with only union members being identified as those who needed to be "treated fairly"!). When the membership agreed with the caucus on that second proposal the party leader said that the vote illustrated the party's "sophistication." Thus did the Wildrose Alliance give the Economist a lesson in subtle and urbane thinking! If the caucus had just argued that Premier Stelmach was right when he claimed that denying a right to strike is "draconian", even when a strike would deny children their right to an education, that would have been one thing, but Rob Anderson called on the membership to "trust the caucus", as if only a Leg grounds insider could really understand. Both Anderson and Heather Forsyth also wanted to turn several other policy planks that teachers' unions don't like into uncontroversial platitudes, and instead of arguing that, for example, the social science evidence indicates that "'school choice' legislation" is a bad idea, Anderson insisted that "anything that suggests 'vouchers' is a red flag." Just why a showdown in the bull ring must be avoided was not explained. As it was, I agreed with caucus and voted for some measures that watered down demands for things like testing because I have come across conflicting research on the topic. I agreed with Heather Forsyth that the party should be cognizant of the fact that eliminating the policy of social promotion denies parents a right. We should only have planks on matters on which we have done extensive research. But expert opinion did not seem to be of as much interest to caucus as the opinion of powerful lobbies. Anderson called on the membership to heed various "stakeholders" and, if I recall correctly, Forsyth opposed every measure that would hold teachers accountable for performance. The problem with this "stakeholders" talk is that it means that when it comes to the budget, should the party try to take away a chair before the music stops from those who are making claims on taxpayer resources, the civil service unions will not be the ones left standing. Given Danielle Smith's assertion that raising royalties was the "single worst decision any premier of our province has ever made", it's fair to expect that the oil patch won't be left standing when the music stops either. There isn't a political party in Canada for which healthcare spending is not a sacred cow. So who will get the short straw, or will no one get it, such that the government spending just rolls on as it did when PC finance minister Iris Evans responded to questions about ballooning spending by asking "where would you cut?" Maybe all the Wildrose words about fiscal conservatism will convert themselves into million dollar bills so that a "stakeholder"-pleasing budget surplus can be painlessly generated? Given how little emphasis the party has placed on corporate taxation since the time when I was a candidate in 2008, I suspect that businesses not directly involved in energy extraction will get little relief from a Wildrose government. The Wildrose leader has already complained that "big corporations" are getting too much from the current PC government (albeit within a specific context where I agree). At the AGM the party membership voted to water down a clause that "a Wildrose Government will increase research and development", a move that I saw as penny wise and pound foolish since R&D and post-secondary education are broadly recognized by economists as representing the biggest positive externalities, i.e. the areas with the best argument for receiving taxpayer support. A growing economy means growing tax revenues, and economic growth is driven by innovation and investment. Who invests in property, plant, and equipment? Corporations. Unions, in contrast, consume, and not only do the incomes, benefits, and pensions they draw represent consumption but they represent a share of provincial income that was acquired by means of anti-competitive practices. Just because they are applied to the supply of labour doesn't make it any less the application of monopoly power. Clearly a society built on consumption will have to pay more attention to saving. ... The battle between borrowers and creditors may be the defining struggle of the next generation. This is the crisis of our age. If the music has not yet stopped, it is going to, and not just one chair but several have to be taken away. I would more inclined to give Rob Anderson the "trust" he asked for if he had not spent the last provincial campaign trying to further expand the legislative presence of a government that had been increasing spending at double digit rates. Back in January of this year I expressed some concern about the floor crossings, not because I was fundamentally opposed in principle but because there appeared to be too much accommodation of the crossers. 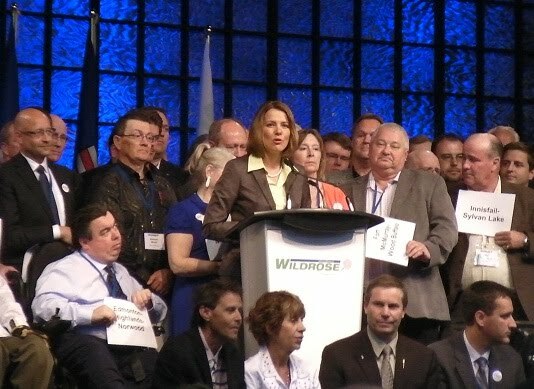 Liza Yuzda quoted Danielle Smith as saying holding by-elections would mean the new caucus members could "be without an income for six months." Now I could sarcastically say "cry me a river" but I wanted to take, shall we say, a "sophisticated" stance on the issue at that time. When Rob Anderson took to the platform last Saturday to complain about his expected remuneration after Link Byfield had just presented the conclusions of his "MLA pay and perks" task force, my opinion on the terms of the floor crossings, or the absence thereof, became a lot less sophisticated and a lot more simple. Link had essentially put some of his political capital on the line at the beginning of this year when he indicated that he believed the floor crossings came about for reasons he had no problem supporting, yet here Anderson follows up Link's one appearance on the AGM platform to conspicuously fail to support Link's work. The capstone to my disillusionment was set when, near the end of the AGM, someone involved in operations told a reporter that every constituency has a membership count of 140 or more. I don't have the latest numbers and am not at liberty to disclose them but I do know that this claim is certainly false. As far as I was concerned, Edmonton Journal reporter Archie McLean was being deliberately misled, and even if the Journal's editorial page hasn't been exceedingly fair with us, Archie certainly has been. The fact that Archie wasn't actually asking for that information is beside the point. Given that it is also the case that constituency organizers have quit because of conflicts with this person, were I in charge I would have deemed giving inaccurate information to the media grounds for firing. Given that the daughter of an Edmonton Decore organizer was fired from staff for no grounds or explanation at all (according to my information), it's not like the party can't do it. Recall that the party's office manager, Heather McMullen, was let go for allegedly "speaking out of turn" at the time of the floor crossings. I was advised by a Wildroser after the AGM that it isn't the same party that I put time and money into in 2008. Of course. But going from the fringe to the mainstream need not entail getting offside with sound policy like that articulated by the Economist, or Jack Mintz, or the economic consensus which has little time for monopolies generally and unions specifically. We do not need every vote. Once the party starts thinking it does, it is hardly different from the P"C" party. When I talked to the new VP Policy last weekend before he was elected about a policy I thought fairly straightforward and a powerful political tool for maintaining fiscal conservatism (by reducing the revenue windfalls that seem to inevitably strengthen the bargaining power of interest groups wanting taxpayer money), namely hedging, I was advised that the hedging concept, or at least its implementation, was likely too abstract. My experience of the AGM suggested that even if sound policy was passed, the caucus is likely to want to water it down if powerful lobbies oppose it with the end result being that caucus' discretion is preserved. Where the party policy book is silent, such as on whether to support a national securities regulator, the caucus does not seem to have felt a need to be less than strident in taking a position in its press releases. My multi-part review of the AGM has become more critical as it went along over this past week and has reached a climax with this post, as I have pointed the finger at caucus (Hinman excepted) for being too accommodating of insider lobbies and/or their own political and financial interests to maintain my confidence in the party's real, as opposed to rhetorical, commitment to enforcing fiscal conservatism and, indirectly but in turn, at the leadership for being too accommodating of caucus. The accommodation started back in December, if not before, but would not have reached what I consider an intolerable level had events at the AGM not reinforced my suspicions about which way the wind was blowing. The AGM was not hijacked by the NDP - don't get me wrong - but neither was the old Reform party hijacked by the NDP; it was rather compromised to the point that it led to a government more centrally controlled (prorogue, anyone?) and fiscally loose (anyone for some Andrew Coyne opinion?) than the Liberal government it replaced (the Harper government has yet to freeze public service wages like the Liberals did). I got off the Tory train several years ago, when it became clear what the direction was. The Wildrose party seems to think that Stephen Harper has shown the way, and indeed he has, but to government, not to principled fiscal conservatism or to the post-partisanship that would ease voter alienation. Ironically, the very hardball political tactics that got the federal Conservatives to a minority government are what is preventing them from ever getting a majority government. We need to play hardball, all right, but with the root causes of the fiscal crisis that looms for developed country governments, a key one of which is the demands of the public sector unions and assorted lobbyists.